I began this book the weekend before Beryl died, and finished it the weekend after. An odd choice perhaps for the time surrounding his death (which, of course, I didn’t know when I began it ...) however the title alone, Life Reimagined, gave me hope, perspective and a sense of, well, life. I read the whole book, cover to cover. I expected it to be a self-help book and was very pleased – it is not! It is all about the science of midlife … about our brains, about relationships, the power of our thoughts, the need for purpose. This wonderful former NPR reporter doesn’t tell us how to do it … but she does educate us on what is important; what is vital. Two messages I want to pass along. 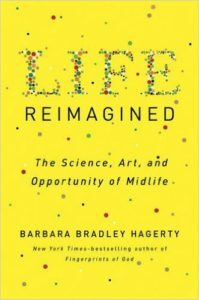 When the author interviewed Robert Waldinger, the current Director of the lifelong study of Harvard men, she asked him, “What are the one or two or three big insights that predicts fulfillment at the end of life?” His answer, which surprised Ms. Hagerty and many readers: “Engagement,” he said instantly. “Maintaining engagement with the world.” (page 42). Read this book if you are in midlife, or planning to be in midlife, or have recently left midlife. It will inspire you.